As one of the best safeties in the NFL, Jairus Byrd will be among the players drawing the most attention in free agency. Though the NFL season won’t technically start until the Thursday night after Labor Day, the NFL’s offseason kicks off on Tuesday at 4 p.m. ET, when the league’s free-agent signing period begins. Owners, take out your wallets. Fans, take out your Twitter and get ready for lots of names – some familiar, some not – signing deals with new teams in a quick 48-hour span. 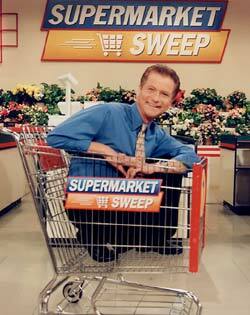 Remember that show Supermarket Sweep? This is the NFL’s version of that, only here, there’s no game show host (the great David Ruprecht, seen here) sitting in a shopping cart telling you if you won or lost. The results won’t really be in until the teams take the field several months down the line. In many cases, free-agent signings – both big and small – don’t show themselves as successes or failures until multiple years down the line. Last year, the first teams to make big splashes out of the gate were the Miami Dolphins (Mike Wallace, Dannell Ellerbe) and the Indianapolis Colts (Erik Walden, Greg Toler, Ricky Jean-Francois). Yet it was the Seattle Seahawks, who waited patiently on Michael Bennett and Cliff Avril, who probably did best of all. Being first and spending the most isn’t always a sure-fire way to get your team back in the playoff mix, but having some dough to spend certainly helps. With a recently announced $10 million increase in the salary cap, all 32 NFL teams have a little extra space in their wallets and a little more flexibility to be creative. Here’s an "All You Need to Know" primer on the free-agent period that’s about to begin. 1. Oakland Raiders: The Raiders haven’t played in a postseason game since losing the Super Bowl to the Jon Gruden-coached Buccaneers in 2003, but you can’t blame the current front office or coaching staff for such futility. The Carson Palmer trade set them back a few years both in the NFL Draft and in free agency, but entering Year 3 of the Reggie McKenzie/Dennis Allen era, it’s time to see what these two can do when given the resources to build a roster. The last two offseasons were all about clearing the books, loading up on young, cheap talent and looking toward 2014. Now 2014 is here, and the Raiders have a league-high $64 million to spend, so all eyes will be on the silver and black come Tuesday. 2. Cleveland Browns: If the Patriots, Steelers and Packers are the league’s poster boys for stability and tradition, the Browns are the NFL’s poster boys for futility. In February, the team fired yet another GM, and in January, they hired yet another head coach (third coach in 13 months). Ray Farmer (the new GM) and Mike Pettine (the new head coach) actually have a ton of young talent on the roster (Josh Gordon, Joe Haden and Joe Thomas are three of the best players at their respective positions). With close to $50 million to spend this offseason, they could (gulp) finally be ready to compete in the AFC North in 2014. A few savvy signings this week would be steps in the right direction. 3. Indianapolis Colts: The Colts front office and coaching staff believe they’re just a few steps away from being a legitimate Super Bowl contender. 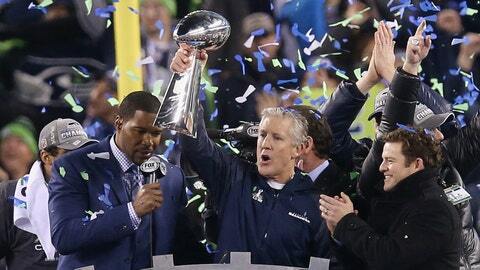 In 2013, Indianapolis beat the Seahawks, 49ers, and Broncos. Andrew Luck is going to be in talks to ink a megadeal either this year or next, but Indianapolis has more than $40 million to spend this offseason. Philip Rivers, Peyton Manning and Tom Brady aren’t getting any younger. Indy’s right there. Now’s the time to strike while the iron is hot. No one knows this more than outspoken owner Jim Irsay. 1. Michael Bennett, defensive end: The brother of the enigmatic Bears tight end Martellus Bennett, Bennett was a revelation for Seattle last season. Let loose by the Buccaneers last offseason, he provided instant depth on one of the league’s top front sevens. He’s a free agent now. Trick or treat? 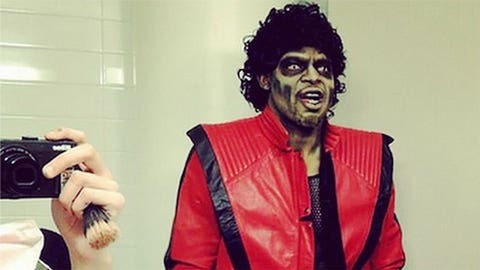 Check out famous athletes in their Halloween costumes. 2. Golden Tate, wide receiver: Tate stepped up when Sidney Rice went down and seemed to be on the receiving end of just about every other big Russell Wilson pass the past two seasons. Serviceable No. 2 or 3 wideout who now has more than enough big game experience to be the veteran leader in a locker room. No shortage of swagger, either. 3. Brandon Browner, cornerback: Browner’s suspension, which could have cost him the entire 2014 season, was lifted earlier this March. Suddenly, one of the biggest, most imposing cornerbacks in the league is a free agent. Browner’s story – CFL long shot to NFL star to missing Seattle’s Super Bowl run – checks all the boxes for an NFL career. Still just 29 years old, he’s got plenty of football left. Which team will help him write the next chapter? 4. Walter Thurmond III, cornerback: When Browner went down, Thurmond (and fellow reserve Byron Maxwell) more than picked up the slack. Thurmond proved he is a reliable defensive back who can be either a starter or reserve. 5. Breno Giacomini, offensive tackle: The 6-foot-7 Giacomini went from a long-term project to a reliable starter in 2013. Can certainly help a need in need of immediate offensive line help. 1. 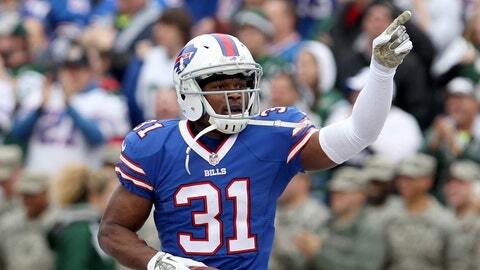 Jairus Byrd, safety, 2013 team – Buffalo Bills: Just 27 years old, Byrd is entering the prime of his career and is coming off his best season yet. He is arguably one of the three best safeties in the NFL. Safeties don’t always attract the biggest bucks, but Byrd could buck the trend. 2. Michael Johnson, defensive end, Cincinnati Bengals: The Bengals boasted one of the best defensive lines in football in 2013. Unfortunately, they can’t all be paid top dollar. Johnson plays every down and is sturdy against the run. Geno Atkins, Carlos Dunlap and Johnson made one of the best young trios in the league. Alas, Johnson will likely end up playing elsewhere in 2014. 3. Eugene Monroe, offensive tackle, Baltimore Ravens: Monroe arrived in Baltimore midseason and immediately took the defending champions’ offensive line from one of the worst in the league back to the middle of the pack. After starring in obscurity in Jacksonville, the former top 10 pick out of Virginia could fetch top dollar from a playoff contender in need of some stability on the blind side. 4. Lamarr Houston, defensive end/defensive tackle, Oakland Raiders: Young defensive ends who can excel in a 3-4 and 4-3 scheme do not grow on trees. Houston, just 26, starred for a Raiders team that didn’t get much national attention or prime-time pub over the past four years. Versatile, hungry and capable of getting to the quarterback and stopping the run, he should fetch big dollars come Tuesday afternoon. 5. Alterraun Verner, cornerback, Tennessee Titans: Verner is not a household name yet, but he will be soon. I asked a GM recently his thoughts on the 25-year-old player, and he told me Verner was recognized as one of the very best in the game. That tells you something. Cornerback Sam Shields got big money to stay with the Packers last week. I’d be surprised if Verner doesn’t get even more. 1. Alex Mack, center, Cleveland Browns: Mack has been one of the few bright spots for a Browns team that’s lived in the AFC North cellar for much of the time he’s played there. The Browns put a transition tag on him, which means they can match any offer for Mack but won’t receive compensation if he signs elsewhere. Right now, the market is set for about $10 million in 2014. Don’t be shocked if a team spreads the salary out over a long-term contract and snatches him away. 2. Linval Joseph, defensive tackle, New York Giants: On a defensive line featuring bigger names like Justin Tuck, Osi Umenyiora and Jason Pierre-Paul, Joseph has quietly become one of the more promising defensive tackles in the NFL. Just 25 and probably a bit out of the Giants’ pay range, Joseph could fetch top dollar this week and cause more than a few fans to scratch their heads and ask, "Who?!" 3. Jared Veldheer, offensive tackle, Oakland Raiders: Out of tiny Hillsdale College and playing on prime time twice a year (at most) in Oakland, Veldheer quietly morphed into one of the league’s top 10 offensive tackles. Capable of playing the right side or left and still improving, Veldheer could see a surprisingly big payday this week from a team hungry to bolster its offensive line. 4. Art Jones, defensive tackle, Baltimore Ravens: Jones isn’t as famous as his two brothers – New England Patriots 2012 first-round pick Chandler and UFC star Jon – but he’s about to have an awfully nice payday. The versatile big fella had his best season as a pro in 2013 and is the rare defensive tackle that can consistently get to the quarterback and also be sturdy against the run. 5. Corey Wooten, defensive tackle, Chicago Bears: Wooten had a big 2012 season in a 4-3 scheme with seven sacks on the edge, but was moved to the 3 technique in 2013. It wasn’t the right fit. In early January, he had surgery to repair a torn labrum in his hip and will be fully healthy by May. Still just 26, lots of potential here. A good fit for a 4-3 team with pass rushing needs. 1. Eric Decker, Denver Broncos: Drafted with Demaryius Thomas and Tim Tebow in Josh McDaniels’ 2010 NFL Draft, Decker has been through it all in Denver. From being Tebow’s go-to guy during their rookie year to being Peyton Manning’s No. 3 or 4 option late in the 2013 season, to GQ spreads to reality shows with his country star wife – Decker’s certainly a household name. Is he worthy of a No. 1 wideout’s salary? We’ll have to wait and see. 2. Hakeem Nicks, New York Giants: Nicks is healthy. He swears. He’s so healthy that 32 NFL teams recently received letters from the esteemed Dr. Robert Anderson and Dr. James Andrews, indicating that previous foot and knee surgeries should not inhibit the wide receiver’s performance in 2014. Nicks didn’t score a single touchdown in 2013, despite being targeted by Eli Manning over 100 times. He’s still got giant mitts, a Super Bowl ring and unlimited potential. 3. Julian Edelman, New England Patriots: In December, I asked Randy Moss – someone who knows a thing or two about the receiver position – to name his top wideouts of the 2013 season. He went with Cleveland’s Josh Gordon and Julian Edelman. Is Edelman merely a product of the Patriots system? A plug-in guy to Josh McDaniels’ offense? Or is he an elite underneath, do-it-all receiver who’s not replaceable? • Marvez: Wasn't this supposed to be classic? • What was that on Carroll's face? 1. Maurice Jones-Drew, Jacksonville Jaguars: Jones-Drew held out two offseasons ago and never got the money he was looking for from the Jaguars. Last year, he had the statistically worst season of his productive eight-year NFL career (3.4 yards per carry). With six running backs already under contract in Jacksonville, it’d be safe to assume his days in North Florida are effectively done. But that might not be the case. There is a bit of sentimentality there, and when Shad Khan, the team’s owner, was asked about MJD’s future in Jacksonville, he replied: "It takes two to tango, but, personally, I would love to see him back." 2. Darren McFadden, Oakland Raiders: One of my great what-ifs of the past 10 years is "What if Darren McFadden was actually ever healthy?" Now, somehow entering his seventh NFL season (it feels like yesterday he was throwing halfback option passes to Peyton Hillis at Arkansas), McFadden was already on the back nine of his NFL career. He has logged 10 double-digit starts in his career, but is one of the best in the sport when actually on the field. 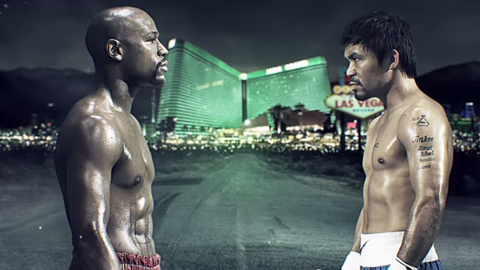 Who’s willing to roll the dice on a the great what-if this week? 3. Knowshon Moreno, Denver Broncos: Moreno grew up in 2013. He had his best year running the ball (1,038 yards), best year in pass protection and was a force in the receiving game. Still, with Montee Ball on the Denver roster and other areas to fill, Moreno will most likely be playing elsewhere in 2014. 1. LeGarrette Blount, New England Patriots: Blount emerged late in the season for New England and proved he could learn an offense in short order. A battering ram at the line and only getting better, he’s a viable free-agent pickup. 2. Andre Brown, New York Giants: Brown has a history of unfortunate injuries, but has always shown he could be the guy when on the field. He won’t make a splashy headline or be a first-round pick in your fantasy draft, but NFL teams know he’s capable of carrying the load. 3. Rashad Jennings, Oakland Raiders: Don’t sleep on Jennings, a guy who’s always played well when asked to fill in for the starting back (Jones-Drew in Jacksonville; McFadden in Oakland). He’s coming off his most productive season yet and ready to emerge as a true No. 1. 1. Antonio Cromartie, cornerback: Just 48 hours before the start of the free-agency period, the Jets bid farewell to Cromartie. The former Chargers first-round pick had a better 2012 than 2013. He’s still a No. 1 or 2 cornerback. 2. Davin Joseph, guard: Let go from Tampa Bay with four years remaining on his contract, the former first-round pick struggled staying healthy and thus couldn’t reach the potential that was expected when the team signed him to a new deal. At 30, he’s still got plenty of good football left in him. He’s shown flashes of dominance; he just needs to be on the field. 3. Sidney Rice, wide receiver: Rice tore his ACL and played just eight games during the regular season for the Super Bowl champion Seahawks in 2013, but when healthy, is still one of the game’s top deep threats. He’s reportedly on track for full medical clearance by the time teams start offseason workouts. At the right price, the seven-year veteran could be the biggest steal of this free-agent class. 1. Justin Tuck, defensive end, New York Giants: Tuck didn’t have the type of 2012 or 2013 he probably wanted, but still showed flashes. Osi Umenyiora got a fairly big deal with the Falcons, and Dwight Freeney got one with the Chargers last year. Tuck has more than just a little game left in his legs and wants a third ring. 2. Donte Whitner, safety, San Francisco 49ers: A locker room leader, a fierce hitter and strong in coverage, Whitner still has a lot to offer. Talk to receivers around the league, and they’ll tell you Whitner is still one of the safeties they fear the most. 3. Kevin Williams, defensive tackle, Minnesota Vikings: An 11-year veteran and onetime star of a feared defensive unit, Williams played just 66 percent of the Vikings’ defensive snaps last season. He missed one game (the season opener) in 2013, marking the first time he missed a game since 2005. When needed, he stepped in at nose tackle and played well versus the Redskins in a rare Vikings victory. 4. Jon Beason, linebacker, New York Giants: When the Giants acquired Beason at the start of the 2013 season, it seemed like it was a guy who was on his last legs. Then, he ended up being the best player on the defense. When healthy, Beason is one of the most reliable linebackers in the game. Amazing veteran leader, too. 5. Tyson Clabo, offensive tackle, Miami Dolphins: After eight years with the Falcons, Clabo signed a one-year deal with Miami and played in 15 games on the most dysfunctional offensive line in the league. Back on the free-agent market, he’s still got some good football left in him. 1. Michael Vick, quarterback, Philadelphia Eagles: Call me a simpleton, call me a hopeless optimist, but I still think Michael Vick has one more chapter left in his NFL career. Now 33 and not blessed with the same wheels he had when he entered the league, he’s not likely to get the mega bucks he did from either Atlanta or Philadelphia. That’s fine. I just want to see what he can do on the field - healthy – as a starter for a third NFL team. 2. Josh Freeman, quarterback, Minnesota Vikings: A year ago at this time, Freeman was considered one of the more talented young quarterbacks in the league. Twelve months later, there might not even be a market for him. Released by the Buccaneers under a cloud of controversy (and rumors), then signed by the Vikings, Freeman made $2 million to play in one game for Minnesota (a dreadful Monday night performance against the Giants). The size, the experience and the arm are all still there. 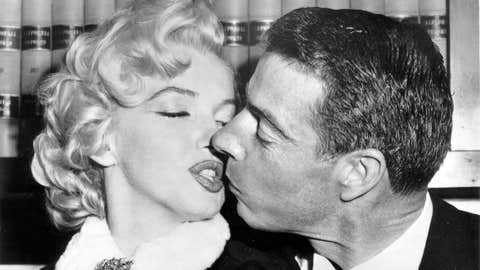 Is the heart and desire? Is an NFL future? We shall see. 3. Jermichael Finley, tight end, Green Bay Packers: Finley suffered a freak neck injury last year versus the Browns that required spinal fusion surgery this offseason. All reports point to a healthy recovery, but it’s an injury a lot of teams might shy away from. When he’s good, there are few tight ends better than Finley. When bad, he’s one of the more frustrating players in the sport. 4. Darren Sproles, running back, New Orleans Saints: Ask a Buccaneers or Falcons fan about the player they’ve feared the most the past few seasons and Sproles’ name will come up first. The Saints couldn’t afford him, but the diminutive running back is still one of the more talented pass-catching backs in the league. Can also be a threat in the return game. 5. Josh McCown, quarterback, Chicago Bears: At 34, McCown had the best season of his career in relief of an injured Jay Cutler in 2013. A reliable backup, sure, but does a team value him as a starter? 1. Dennis Hickey, Miami Dolphins: The old right hand man to former Buccaneers GM Mark Dominik, Hickey joins the Dolphins front office with more than a few areas to address. The offensive line had a more than turbulent year and there’s plenty of holes on the defense to address. Miami has lots of cash to spend this year. How will Hickey go about spreading the wealth? 2. Jason Licht, Tampa Bay Buccaneers: Licht has already been active, re-signing running back Bobby Rainey and releasing Davin Joseph. It’ll be interesting to see what the former Arizona Cardinals staffer does in free agency, the NFL Draft and with the monster contract given to Darrelle Revis by his predecessors. 3. Ray Farmer, Cleveland Browns: The Browns have money to burn and several areas of need. How will the first-year GM go about rebuilding one of the NFL’s most moribund franchises? It all starts on Tuesday. 1. Eric Decker rejoining his former college offensive coordinator and 37-year-old wunderkind Jedd Fisch with the already rapidly improving Jacksonville Jaguars. 2. Michael Bennett joining his brother Martellus in Chicago and bolstering a defensive line in desperate need of some depth. 3. Michael Vick going to Oakland … and leading the Raiders to the playoffs in 2014. Hey, anything’s possible.